Toronto’s G20 artificial lake brings cottage country ambiance to a media pavilion in a militarized security zone in Canada’s largest city. Sorry, I shouldn’t call it a lake and certainly not the #fakelake. It’s a reflecting pool. The pool will be decked out with a dock, Ontario cottage country’s signature Muskoka chair, canoes, and the recorded sound of calling loons. In the background, a 10-meter screen will show a video loop of cottage fun. According to spokesperson for Muskoka tourism, Michael Lawley, the goal is “to recreate a dock experience” for the thousands of journalists who will be in town to cover the G8 and G20 event. “We’re trying to make a memorable impression,” he said. Indeed. 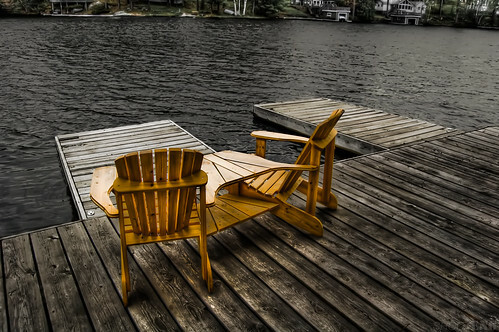 It’s difficult to read about the plans for the pavilion without asking a lot of impertinent questions about whether the loons will be audible over the press conferences, whether there will be enough chairs for everyone, and what, exactly, is Muskoka tourism’s idea of cottage fun. Will they play beer commercials? Canada’s opposition parties are having a grand old time attacking the project. How could they not? It’s such an obviously terrible idea that from the outside, it’s very difficult to understand how anyone could approve the thing. There’s a kind of mad evolutionary logic at play. Canada is hosting the G20 and G8 summits back to back and the original plan had them both happening in the Industry Minister’s home riding in a town called Huntsville (pop. 18,000). This explains how Muskoka tourism got involved. Meanwhile, the second insane evolutionary process plays out as the weekend of meetings is encased in a protective shell, the design of which has been refined and re-refined since the embarrassing 1999 Seattle protests. True to the spirit of globalization, the system of fences, security, and protest is nearly indistinguishable from event to event and place to place. Subtopia talks about it as a travelling stage show but it’s much weirder than that. In a travelling stage show, the same cast puts on a performance in different venues. But almost none of the players in these events are the same. Protestors and security forces are largely drawn from the local populace. Even the special guest-starring international cast of civil servants, world leaders, and journalists rotate constantly, subjected as they are to the ravages of promotion, demotion, cabinet shuffles, and failed re-election. This isn’t a travelling show, this is theatre companies mounting the same production all over the globe. When it comes to the performance at the fence, the one thing that remains constant is the set decoration and costume design. The same 12′ steel sheet with concrete feet snaking around the city. The same black hoodies and face bandanas. The same riot shields and batons. 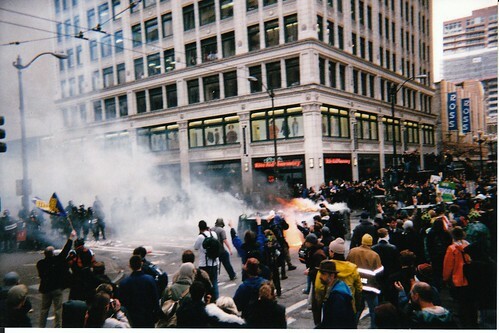 The same tear gas and smoke and pepper spray. Managers at Starbucks and McDonalds would kill for a global brand this consistently implemented. Here’s City of Sound talking about the APEC fence in 2007. I overhear people talking of going to actually see The Fence, as if it were a new temporary attraction, and when I visited on Wednesday, many Sydneysiders were just hanging out in the “sniper-ridden ring of steel”, watching the whole circus. News sites are full of it, and Sydney has been radically altered for a few days. There is plenty to see. Notice that only the name of the city distinguishes it from BlogTO heading out to gawk at our instantiation. There’s been much made of the recent start of construction on the G20 security fence in Toronto. But, lacking a good conception of its size and breadth, I decided to mosey on down to the area around the Metro Toronto Convention Centre to see what I could find out about this thing. As it turns out, I got a pretty good idea for how intense the police and security presence will be. 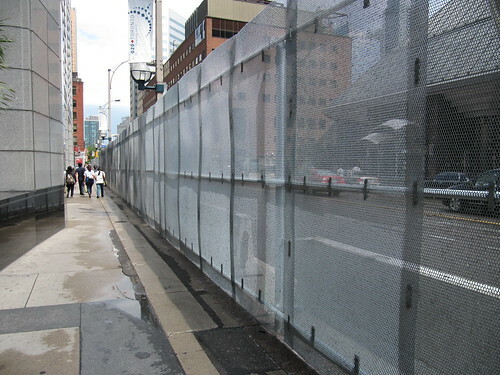 BlogTO Toronto’s G20 fence in photos. These are mimetic structures. Their design is transmitted all over the globe, reproduced via security conferences, marketing materials, anarchist forums, and planning committees. From the perspective of the city it’s a weird malignant parasite that arrives, takes over, completes its terrible purpose, and then neatly self-disassembles. In the midst of all this, our main university is closed, our baseball team is playing its home games in another city, our streets are ringed with steel and police and snipers, our windows are boarded up, and our most recognizable landmark has been shut down. When the city is least like itself, conference organizers hope to showcase it to the world. So they release bland stock footage for newscasters. They make models of our famous landmarks. And they build simulacra of the cottage country where the conference should have happened, if all had gone according to plan.